Coming to Seattle in February, 2020! Are you a movement educator seeking your next level of flexibility, strength, and function, plus a deeper approach to teaching? Join us. Through the Franklin Method© Level 1 Teacher Training you’ll optimize your own function, form, and mental state. You’ll revolutionize your teaching style so you can inspire more students, increase participation, and create better results. Students who are feeling stiff and stuck will learn how to become supple, calm, and energized through a short daily practice. The ones who are already doing pretty well will go from good to exceptional. Using evidence-based flexibility and strength-building techniques in conjunction with Franklin Method© balls and bands. These practices increase the brain’s capacity for self-healing and work for audiences of all levels and backgrounds. The more you practice Franklin Method©, the better your results. There’s no limit to how well you can perform and how good you can feel when you have Franklin Method© tools in your pocket. The Franklin Method Bone Rhythms for whole body coordination and efficiency, imaging the movement of the bones in real time for optimal design activation. How to train to go from average to outstanding. Longer life span without an intensive physical therapy plan. Energy and stamina when you need it – without resorting to extra coffee. Steady creativity, so teaching feels fun, rewarding, and simple. Better sleep, so your body has a chance to restore and repair every night. Solid focus, even if you’re easily distracted and often feel scattered. …would you want to learn it? It’s called Dynamic Neuro-cognitive Imagery™, and it’s a scientific approach to improving your anatomical function and form through embodiment and mental training. Quick, effective Franklin Method© ball and band exercises will make you feel better in just a few minutes. You’ll forget what tightness feels like, build strength and flexibility, and learn an entirely new approach to teaching movement. Instead of thinking or reading about the mind-body connection you’ll have a physical experience of it and get the tools to explain it to others in a way they’ll immediately grasp. Whether you’re a pilates instructor, dance teacher, or simply a fitness fanatic, becoming a Franklin Method© Educator will rewire your body for self-healing and top function. Plus, you’ll get a whole new toolbox of skills to share with your students and/or loved ones. Franklin Method® is a scientifically-proven mind-body healing method that blends embodied function and Dynamic Neuro-cognitive Imagery™. It’s the fastest and most effective anatomy-based approach to permanently retraining your body and mind for optimal function. Franklin Method® guides your body to move in alignment with your natural internal function so you can build strength and increase flexibility without straining yourself. Most forms of exercise and movement teach you to contract your muscles, which works against your anatomy and makes you weaker, tenser, and more prone to injury. Franklin Method® guides you to move with the natural patterns of your muscles and organs, improving your daily experience and physical performance. Through Franklin Method© we practice moving the way we are designed to function, and soon it becomes second nature.People who practice Franklin Method® are strong, flexible, and experience little to no tension. They feel light, energized, and free of pain almost every day. They have great posture and know what’s happening in their body at any given moment. 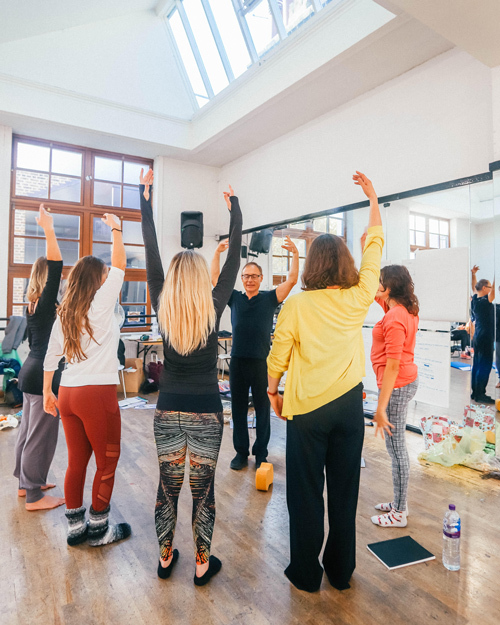 In this Level 1 Teacher Training you’ll learn the basics of Dynamic Neuro-Cognitive Imagery (DNI)™, embodied function, and proprioception in all their applications. We’ll especially be focusing on how the bones naturally move to support efficient, effortless movement using the Franklin Method© Bone Rhythms. We’ll cover fundamentals such as biomechanics, posture, and breathing. “Twenty subjects with idiopathic PD [Parkinson’s Disease] … were randomly allocated into DNI [Dynamic Neuro-Cognitive Imagery] training … or in-home learning and exercise program. DNI training focused on anatomical embodiment and kinesthetic awareness. Imagery abilities, disease severity, and motor and nonmotor functions were assessed pre and post intervention. The DNI participants improved in mental imagery abilities, disease severity, and motor and spatial cognitive functions. Plus, you’ll get exclusive access to the Interactive Training Facebook Group. Revolutionize your teaching style so you can inspire more students, increase participation, and create better results.